Posted on December 10, 2017 by revivewa	in Features and tagged 1, Christmas, feature. Christmas is such a joyous time. The kids are excited, the tree is glowing, and friends and family come together to share gifts and food to celebrate the season. But as we go through life, it’s inevitable that each of us will suffer grief, loneliness or sadness. Christmas can be a painful reminder of those times. Christmas can bring back memories that are hard to live with; for some it’s a reminder of the physical distance between loved ones, others may be separated from their children as they spend a happy Christmas with their other parent, or maybe it is a reminder that a friend or family member is no longer with them to celebrate the season. 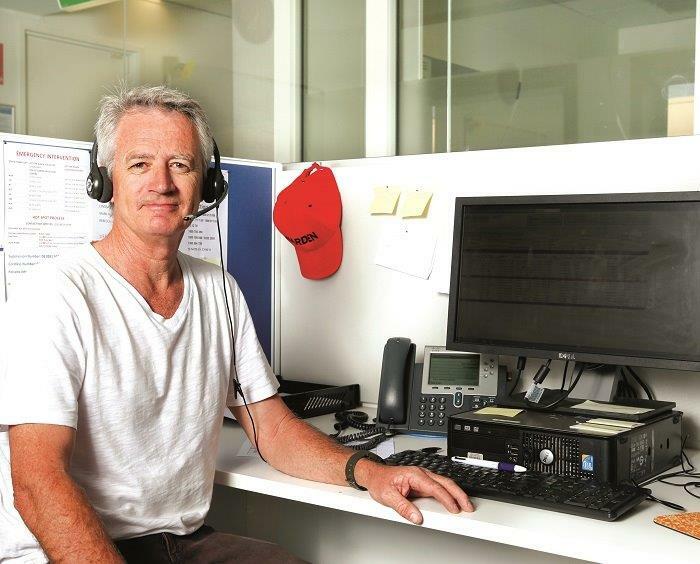 Damien, a Lifeline WA Telephone Crisis Support Worker Volunteer. There are many reasons why someone might be feeling low over Christmas, and it’s hard to be happy for others at Christmas when you feel down about your own situation. Many who are struggling will remain silent, because they don’t want to bring others down during a happy time. But there is always support. Lifeline WA is a leading suicide prevention organisation in WA offering crisis counselling over the phone or via online chatting. Uniting Church in the City has been a longterm supporter of the charity, which has Methodist roots. Christmas Day is one of their busiest days of the year. Lorna MacGregor, CEO of Lifeline WA said their support service is available 24-hours, every day of the year. overpowering challenges that many West Australians experience, from loneliness and relationship break down to economichardship and mental illness,” Lorna said. “For many people, Christmas and the holidays are a happy time, with an opportunity to relax, catch up with family and friends and celebrate the year that is coming to an end. But for some people, it can be a different story. “Christmas is a busy time with lots of pressures associated with it including, shopping, cooking, cleaning and organising, and travelling. Many have financial pressure, and feel that they cannot afford the cost of all the festivities. Family and relationship problems may increase during this time, substance abuse or domestic abuse may increase. In the lead-up to Christmas, some churches will hold Blue Christmas Services to acknowledge pain and sorrow felt ] by some during the Christmas period. Rev Stephen Larkin leads an annual Blue Christmas Service at Nedlands Uniting Church, and said they offer a safe place for people to sit quietly and reflect during worship. “Christmas for many people is not a happy time because of various issues, often related to the death of a loved one, but it can be for other reasons as well,” Stephen said. He added that people often feel pressured that they are supposed to be happy at Christmas time, as it’s a season of joy and festivity, fun and laughter, and presents. And yet many can’t feel all of that joy because they still hold grief – which they may feel others think they should be over. The Blue Christmas Service invites them to let go of those feelings. Nedlands Uniting Church’s Blue Christmas Service is usually held on the Sunday evening before Christmas. It celebrates the season with Christmas carols and prayers, but also invites people to reflect on their grief in symbolic ways. Last year’s service saw attendees writing down their grief or situation on paper and placing them under a Christmas tree. These writings were later burned. Stephen said the service also includes time for quiet prayer so people can reflect, and bring themselves and others they may be thinking of before God. The lighting of candles is a way to publicly acknowledge pain in a private way. For most who attend, they may not be in a current time of crisis, but do want to take some time to remember past pain, as Stephen himself is reminded of loved ones over Christmas. “It’s not necessarily that these people who come are unhappy, but it is an opportunity to acknowledge grief or pain,” Stephen said. “It’s not necessarily a spot where people are in the midst of despair, but it is saying that Christmas time reminds them of things that makes them sad, or their loneliness. “It might be that their kid died 20 years ago and every Christmas they’re reminded of it. “For me, my mum and dad died when I was in high school and in early adulthood. That’s a long time ago, and they didn’t die at Christmas, but when I do the service that’s a couple of things I think about. It’s a chance to reflect on the losses in my own life – and that’s not a bad thing to do. “I think it’s an important pastoral event. It recognises that not everybody is necessarily happy all the time. It provides a safe space for people to be able to worship and still remember those things that are hard for them. “It’s okay to still be hurting, to acknowledge loneliness and hurt and sorrow – it’s a part of our life. “Life can be tough, but we can still worship in the midst of that and through that. Church isn’t just a happy clappy place. It needs to be honest. Stephen also challenges the Nedlands congregation to think beyond themselves by giving the same amount financially that they spend on presents to one of their church causes: Act for Peace Christmas Bowl, Uniting Aid and other international projects. This year, Lifeline WA is holding their own symbolic action, through their ‘Shine a Light for Life’ campaign. A beautiful Christmas tree representing all the West Australians who have been brave enough to call Lifeline WA for help throughout the year is on display at Elizabeth Quay over the Christmas period. People can show their support by dedicating their Christmas tree or lights to the campaign; simply upload a photo of your display to social media using #shinealightforlife to get involved. You can also donate to Lifeline WA at lifelinewa.org.au. It costs $25 to fund one crisis support call to Lifeline and contributions to the campaign will directly support Lifeline WA to expand its crisis support services and train more volunteers so that they can answer every call. “Our message to people who might be struggling is that tough times do pass – they do for many thousands of Western Australians each year and they can for you too. If you or anyone you know needs help, please call 13 11 14,” said Lorna MacGregor. In times of crisis, Lifeline WA is available for support on 13 11 14 or at lifelinewa.org.au. You can also visit the Lifeline WA website to donate. The Blue Christmas Service at Nedlands Uniting Church will this year be held on Sunday 17 December, 7.30pm. More Christmas Service times can be found on the Uniting Church WA website at unitingchurchwa.org.au. Thank you for your constant love and for the blessings of this day. Even when we cannot see or feel you, we are not alone. In the difficult times of our lives, help us to remember you, and to listen for your voice in the words of family, friends, and even strangers. As the light of a small candle lights a dark room, let the light of your Holy Spirit bring light to our lives, and to those who are grieving, lonely, forgotten. May your presence dwell deeply in our hearts, and may it pour forth from us on others who we meet through life’s journey.